The Trump administration has sought to militarize the region from the start. 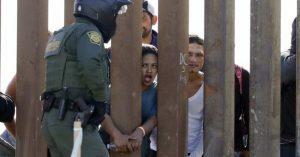 While a physical wall will likely go unfunded with Democrats now controlling the House of Representatives, the president has nonetheless achieved its central aim. By separating childrenfrom their migrant parents at the border, the Trump administration has exerted its dominance over a vulnerable population, and signaled to its supporters that it will not simply accept white nationalism as a byproduct of American empire but embrace it as a matter of public policy. As of October, administration officials had failed to reunite hundreds of these children with their mothers and fathers, months after a court-imposed deadline to do so.